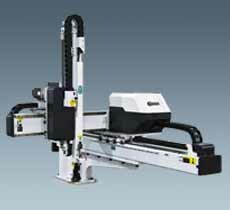 The ST2 series robot is designed for rapid and precise removal of sprue and products from injection molding machine. One arm and double arms, standard and telescopic arm(s) are selectable according to the application of 2-plate mold, 3-plate mold or hot runner system. Multiple stop points in Z axis, convenient for package. Suitable for injection molding machine under 450T clamp force. Y-axis servo suitable for single, short cycle time mold. Stacking function provides multiple stop points in Y1 and Z axis. X-axis servo is suitable for frequent mold application, easy to adjust crosswise stroke. Stacking function provides multiple stop points in X1 and Z axis. Two servo axes are driven by heavy duty servo motor with cooperation of precise linear rails and high power V belts; fast, silent and precise. 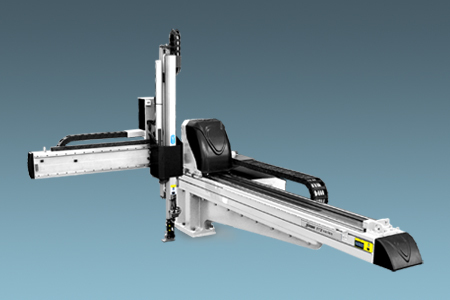 Wrist mechanism employs pneumatic driven rack and pinion system, which accomplishes smooth, stable and precise flipping motion. Vertical arm(s) with telescopic design efficiently minimizes the cycle time and height of the robot. High efficient shock absorbers allow fast and precise pneumatic driven motion. Position limit sensors and blocks effectively prevent mechanical and electrical malfunctions. Control board with short circuit function. 3.2 inch true color LCD, each output signal control with intelligent detection, short circuit, overload, thermal protection. Real-time monitoring the status of robot. Display error messages, easy to operate and keep safe use. Depend on the configuration, flexible to set the extend input and output, provide plug and use without modify control system. Easy to use but powerful teach program with verity modes of servo positioning, can use conditions judgment, loop control, waiting and so on signals. The servo positioning support 10 cycles location area, each matrix size up to 99×99, capable of arranging and stacking functions.